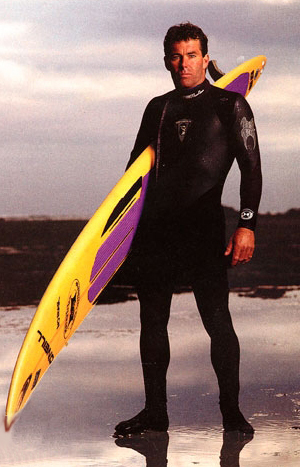 Jeff Clark is one of the most renowned and respected big wave surfers in the world, regarded by the surf community to be a member of a small group of pioneer watermen. Jeff is best known for successfully pioneering the massive waves of Mavericks alone for years before it was discovered by the big-wave surfing community. Mavericks, located south of San Francisco, is considered to be one of the most dangerous big waves on the planet. In 1975, as a hard-charging 17 year-old, Clark first paddled out to this monstrous wave located more than ½ mile off the coast, in his own back yard near Half Moon Bay. For 15 years, he surfed this wave alone, with only his ability and determination to find his way. The spot was, until then, known as a navigational hazard. But Clark saw a perfect wave, and from there he set a course to pursue the ocean’s energy, a living laboratory for his many interests and innovations. Labeled one of the “world’s best big-wave riders” by Surfer magazine in 1994 and among the 100 bravest people in the U.S. by PBS, Clark has been featured in the films Riding Giants, Step Into Liquid, Adventures in Wild California, Discovering Mavericks and many other films. A third generation carpenter, Jeff shaped his first surfboard at the age of 12. He later shaped boards specifically designed for big wave surf, and specifically for the challenging technical wave at Mavericks. He changed big wave surfing by introducing the first four-fin big wave surfboards and riding them at Mavericks. The design worked so well that others immediately followed, and the four-fin setup is now the standard for big wave surfing worldwide. Jeff Clark Surfboards® custom stand-up paddleboard and surfboard designs incorporate Jeff’s designs to improve speed, performance and pure joy for anything from flat-water racing, downwind paddling, and surf conditions from two feet to 60 feet and all the way to spinning barrels. Clark is also the founder of the famed Mavericks surf competition, an event that has put big wave surfing in mainstream sports and has launched the careers of surfers, photographers, water rescue teams and many others. He owns and operates the iconic Mavericks Surf Company® and Mavericks PaddleSports in Princeton-by-the-Sea near Half Moon Bay, with his own line of Mavericks Surf® brand clothing and surf wear. - Stunt and camera boat driver on open ocean set of a 20th Century Fox film Chasing Mavericks. His skill in navigating waves and dangerous waters has provided many filmmakers and photographers the opportunity to capture on film the power and beauty of the ocean. Jeff supports many other organizations that help our communities, particularly in the area of health and wellness, including St. Jude’s Children's Hospital, Sonoma Children’s Charities, Schultz Foundation, the Cystic Fibrosis Foundation, Navy Seal Foundation, Boys and Girls Club of the Coastside, Coastside Hope, Half Moon Bay high school and middle school surf clubs. While Jeff continues to surf and perform water rescue in big wave spots around the world, he is inspired by his three children and two grandchildren. He shares his motivational life lessons with fans and audiences across the country and through all industries. Jeff remains as stoked as a grom to paddle out in any surf anywhere from two to twenty feet. He has found his wave.